President Maithripala Sirisena revealed, yesterday, that the first action he took using his executive powers was to remove former chief justice Mohan Peiris, when he came and begged him not to remove him from his post and expressed his willingness to do anything he wanted. The president disclosed how Mohan Peiris visited him at his residence after he assumed duties on January 9, 2015 and promised to take action in his favour and implored him not to remove him from his post of CJ. The president revealed this while addressing a public meeting in Warakapola. “Chief Justice Mohan Peiris came to meet me at 10.00 pm on the day after I assumed duties as president and told me not to remove him from his post. He said he would deliver his judgments according to my wishes. I told him there was no intention of removing him from his post and told him to leave my residence,” the president said. But he returned the next day and begged me not to remove him from his post, he said. This is very clear Sir, how many wrong judgments Mohan would have given only listening to Mahinda Rajapakshe. What a shame of this fellow. This 'CJ' had to be removed - so even if Prez exceeded his powers - this one instance of 2 wrongs making it right. Truth is Truth anyway. Hay public - His Excellency President MS will rule our nation for another 20 years. First of all you guys should know how patiently our Hon. President kept this secret till now. He should have expressed this on the same day and arrested and kept Mohan Pieris behind bars. We can imagine the type of judgement he had given. Bloody shame, not only as a CJ but even as an ordinary person holding public office! Isn't there a way to send him behind bar for this SHAMELESS "breach of public trust" and stop his pension??? Mahinda kept Mohan as his pocket baby. Ha..Ha..Ha..
Mohan thought that he could fool MS, but MS knows how to go through Mohan's mouth and come out through his ears. MR only a Kadiya, but MS is a Lion. Why he wanted to make this statement at Warakapola temple. He should have said this at meetings he had with proffesionals. That is the proper place not at temples. We heard this story long time ago also. We should now hear what Mohan Peiris has to say about this. Then we can know whether this is true or just another way telling people that MS has some power. In SriLanka if you go and tell something even in a remote village, like a wild fire, it will be spreaded globally. Are you still in the Kopi Kaday period. Yes this event was subjected for Bribery. Mohan should be arrested and it will be a hard slap for Mahinda. You should be first arrested for hiding important matters. We have to look into the circumstances lead to this appointment.. How appointment made? If the story is correct what about general public suspicious that "judiciary was corrupt ". and judgments given. Also this give enough evidence to other organisations gather information against Sri Lanka. Has the ex President MR got to say anything contradictory, or any of his henchmen, Professor GL are you there to defend ! What about the other fellow of "Helping Hambanthota" frame? 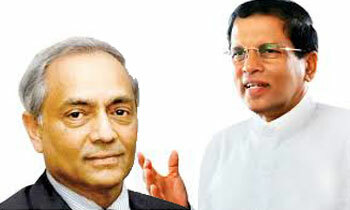 Mohan Peiris's appoinment was considered null and void. This is not the first time the president revealed this incident. He has said it before just after the elections. Ya ya all he has to do is keeping secrets very carefully, that is what people expect from a president. And yes he will rule this country next 20 but unfortunately in your dreams! truth comes out near to an election, how funny. Hih Lion? made of porcelain or clay ? or wool? The opposite happened to those who didn't cow down to MR's will. So there!!! Mohan Peris is not fit person to be the C.J. in this country.I am a retired judge. when I was the District Judge of Moratuwa I was summoned by Mohan Peiris to the JSC and ordered me to resign immediately as I did not give the judgment in the case No.L.27 in favour of Plaintiff as his relative lawyer gave evidence on behalf of the Plaintiff. I highly appreciate the HE's decision. Hih! hina gihin six packs enawa me comment walata. "MS will rule our nation for another 20 years"
I THINK PRESIDENT TRUMP IS ALSO FOLLOWING OUR FOOT STEPS. I wonder why CJ Silva has always been behind MR, cos MR has his old files. wool one is much cute than clay one lol! We all know who Mohan peiris is. He wouldnt have been the CJ is the legal system was in place at that time.